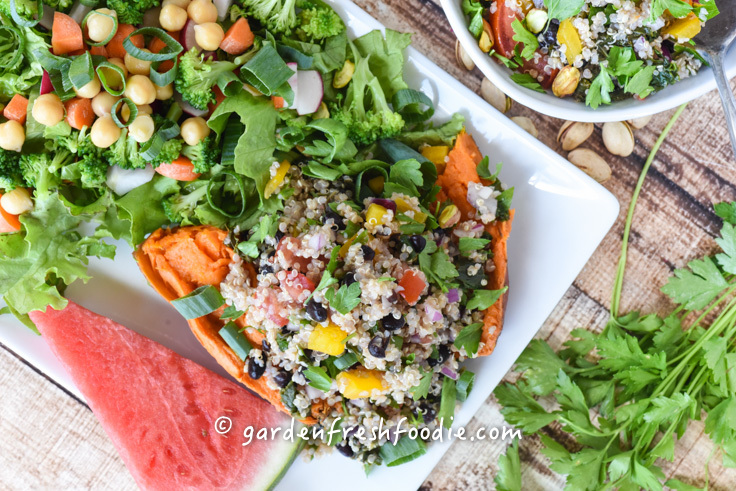 This quinoa salad kicks up the heat and is packed with protein, fiber, and lots of micronutrients! Add in the greens, and you’ll add in additional fiber, protein, and calcium. I always try to get those greens in! One tip, I presoak my quinoa, as I find it cooks better, is easier to digest, and removes the somewhat bitter taste quinoa can have. To soak it, simple place the quinoa in a bowl and cover with water. Let sit at room temperature for at least 4 hours, or longer (can go the whole day), and then rinse and drain before cooking. This dish is great served on top of salad, a sweet potato, or omit the avocado and use as a stuffing for peppers and bake them in an enchilada sauce. I photographed this making the dish with raw vegetables (onion, peppers, tomatoes), without the avocado. I think it’s more wintery with the cooked veggies, and better in the summer raw. Alternative to quinoa-you can use millet which is another ancient high protein grain. Heat a large skillet. Once hot, add in onions, garlic, and 1-2 tbps water to prevent sticking. Sauté until slightly golden, add in jalapeño and bell peppers. Stir in quinoa, beans, broth, tomatoes, cumin, salt, and bring to a boil, reduce heat to simmer and cook until quinoa is softened (not mushy), about 15 minutes. Add additional broth if needed. Fold in corn. If using spinach, fold in once the quinoa has cooked. If using kale, blanch in a separate pan and fold in at the end. Add lime juice and fresh cilantro. Save avocado as a topping, as it doesn’t taste good if folded into hot food. Great served on top of salad, a sweet potato, or omit the avocado and use as a stuffing for peppers and bake them in an enchilada sauce. 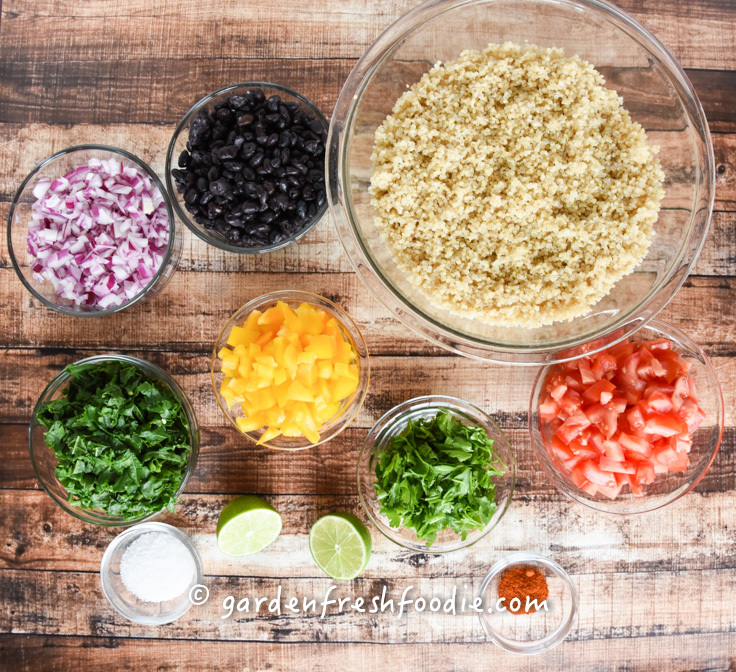 Mexican Quinoa Salad-great on top of a sweet potato, salad, or stuffed in peppers as a protein packed, plant-based, oil free dish. Add lime juice and fresh cilantro. Save avocado as a topping, as it doesn't taste good if folded into hot food.